Below you will find interactive maps and directions to find us, on foot or cycle, or by road, rail and air. From Toulouse and the Mediterranean, take the autoroute A64, exit at Salies de Béarn, and then follow the D933 direction Saint Jean Pied de Port for 60 km. On the approach to Saint Jean Pied de Port, just below the walls of the Citadelle, turn onto the D401 signposted Caro, a very sharp left. After 500m, take a very sharp right, signposted for the Chemin de Saint Jacques. After 200m, look out on the right for Errecaldia. From the direction of Paris, and also from the direction Madrid, take the autoroute A63, exit at Bayonne, and then follow the D932, signposted for Saint Pied de Port, for 50 km. This road becomes the D918 in Cambo-les-Bains, still signposted Saint Jean Pied de Port. Follow the D918 through the town centre of Saint Jean Pied de Port, and then look for D401 signposted Caro, an acute right. After 500m, take a very sharp right, signposted for the Chemin de Saint Jacques. After 200m, look out on the right for Errecaldia. Our local airport, at 50km, is Biarritz, with flights from Lille / Nantes / Marseille / Manchester / Strasbourg / Dublin / Geneva / Stockholm / London / Lyon / Nice / Paris and Rotterdam. From Biarritz Airport, the number 14 Chronobus (timetable here) goes to Bayonne, a journey time of about 40 minutes. Be very careful, the number 14 runs both ways from the airport, make sure you get on the bus running to Bayonne Gare (the station). Taxis run from the stand outside, and the cost to Bayonne rail station is about 20 euro. 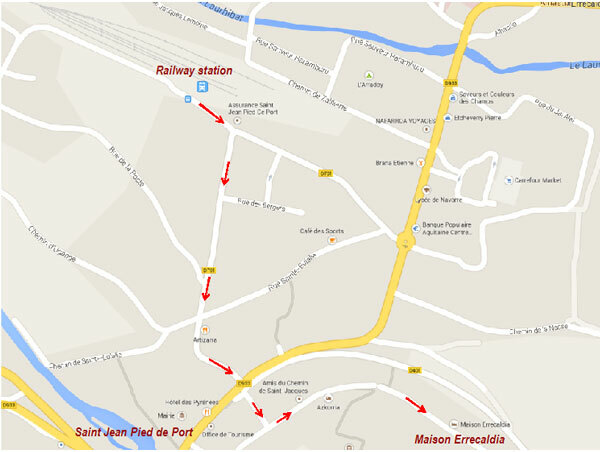 From Bayonne station, take the train to Saint Jean Pied de Port, see Train Travel. If you prefer, Express Bourricot runs a daily mini-bus service and taxi services to order from Biarritz Airport to Saint Jean Pied de Port, or to our door if you are lucky! Further away, at 240km, is Bordeaux Airport, with flights from Belfast, Birmingham, Bristol, Cardiff, Cork, Dublin, Edinburgh, Glasgow, Liverpool, London and Southampton. A shuttle runs from the airport to the railway station in Bordeaux. From Biarritz station, take the train to Saint Jean Pied de Port, see BY TRAIN. Errecaldia lies on the Chemin de Saint Jacques, the Camino and the GR10, GR65 and GR78. All of these routes join at the Porte Saint Jacques and then drop down the Rue de la Citadelle to the heart of Saint Pied de Port. 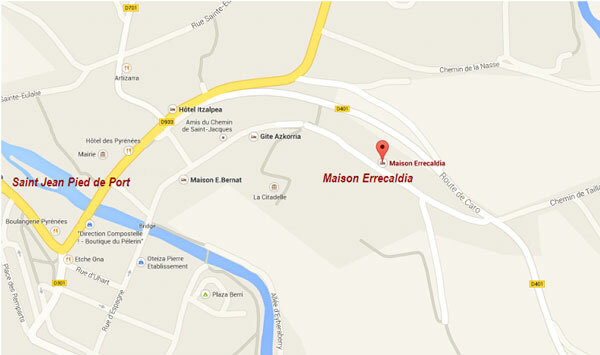 Errecaldia lies 120m to the east of the porte, look out for our yellow bed-and-breakfast signboard. From the town centre find the Office de Tourisme, opposite Les Pyrenees Hotel. Behind it, looking uphill, you will see the archway of the Porte de France in the Citadelle wall. Go through it, and straight on up the cobbled street (Rue de France). At the end, turn left, and up Rue de la Citadelle. As you go through the Porte Saint Jacques, a UNESCO heritage site, the road becomes the Chemin de la Porte Saint Jacques, and you will find Errecaldia on the left near the top of the rise, the second building on the left after the porte. Look out for our yellow B+B sign board. By road, from the D933 / D918 go through the town centre of Saint Jean Pied de Port, and then look for D401 signposted Caro, a shallow right. After 500m, take a very sharp right, signposted for the Chemin de Saint Jacques. After 200m, look out for our yellow B+B sign board on the right. Use The Trainline, SNCF / TER, Rail Europe or EuroStar to plan your journey to Bayonne. You may need to break the journey into different stages between major destinations such as Paris. Follow the link below for train times Line 62: Bayonne / Saint Jean Pied de Port. From the station, it's ten minute's walk (1km) to Errecaldia. Turn left from the station, and then first right into Avenue Renaud. 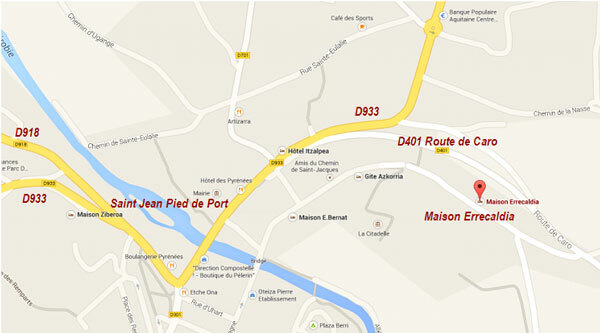 After 400 metres, you will come to the main road through Saint Jean Pied de Port. Cross over, and up the steps opposite, through the archway of the Porte de France in the Citadelle wall, and straight on up the cobbled street (Rue de France). We speak English or French, and can translate emails in other languages. We highly recommend Tim & Louise' place. It's close to everything in town, yet has the comfort and quiet of a country home. We arrived the last evening of a festival and we're delighted by fireworks at our window. It was a perfect way to start. This is a great place to stay in Saint Jean Pied de Port. The rooms are very nice, clean and private. A good starting point for exploring the town and the Pyrenees. We were hosted by Valerie, friend of the owners, who with her enthusiasm for the region made our stay very special. We hope to be back! Great location in a wonderful village. Tim and Louise made my stay exceptional! The room was very clean and comfortable. A truly special place. Thank you for being so kind! You two were perfect hosts! Tim and Louise made me feel at home from the first moment. Just the right amount of welcome. Tim and Louise's b&b was warm, clean and comfortable and close to everything in St Jean. A lovely breakfast too. Would highly recommend staying here. Thanks Tim and Louise. This B&B is even more beautiful and special - than any pictures convey. Tim was a gracious and helpful host. He made for us a delicious French breakfast with all local foods. It was just what I needed to help rejuvenate and motivate me on my way forward to the Camino de Santiago. I wish I could describe the views from my balcony. You'll have to see for yourself!! I loved staying at this place! it is really cozy and nice! the breakfast was delicious. Clean home in great location. Nice, interesting host. Good breakfast of bread, butter, locally made jam and ham and choice of beverage plus juice.